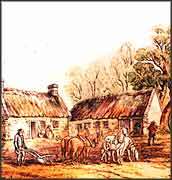 Robert Burns remained at Lochlea until his father's death in 1784, after which the family moved to Mossgiel farm, near Mauchline. 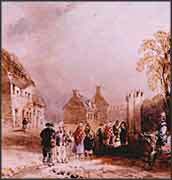 In Burns's day the Church of Scotland — 'the Kirk' — played a central spiritual role in rural society, but it also functioned as the guardian of public morality. 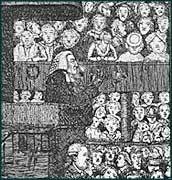 Burns's womanising and choice of friends brought him into frequent conflict with the Kirk, but his criticism of the Church was largely reserved for the double standards of some of its leading members. 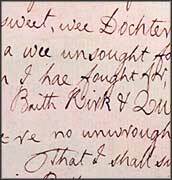 Despite this, the vivid stories and beautiful language of the Bible thrilled Burns's poetic imagination, and in his letters he quoted from it widely. The years 1784 to 1785 were one of Burns's most prolific periods. During this time he wrote such well-known poems as 'Holy Willie's prayer', 'To a mouse', 'The jolly beggars' and 'The holy fair'. 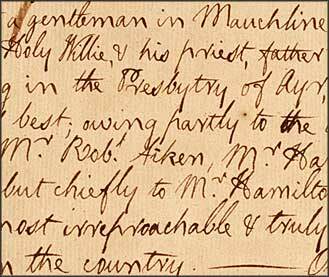 Holy Willie's Prayer next made its appearance, and alarmed the kirk-Session so much that they held three several meetings to look over their holy artillery, [to see] if any of it was pointed against profane Rhymers. — Unluckily for me, my idle wanderings led me, on another side, point blank within the reach of their heaviest metal.